Oven 375° Oven Rack in center position. Blanch Asparagus in 1 quart salted boiling water until crisp-tender. (about 2 minutes). Set ham aside. Whisk all remaining ingredients in medium bowl. Add optional ingredients to enhance recipe. Spread asparagus and ham evenly over bottom of warm pie shell and set shell on oven rack. Pour in custard mixture to ½” below crust rim. Bake until lightly golden brown and knife blade inserted about 1″ from the edge comes out clean. The center will feel set but soft like gelatin. Bake 32-35 minutes. Place on Rack to cool. Serve warm or at room temperature. While quiche is cooking, wash fruit. Core apples and slice in 1/4″ slices. Use lemon juice on exposed apple flesh as to not oxidize. Peel and section oranges. Alternate apple and orange slices on plate following the rim. 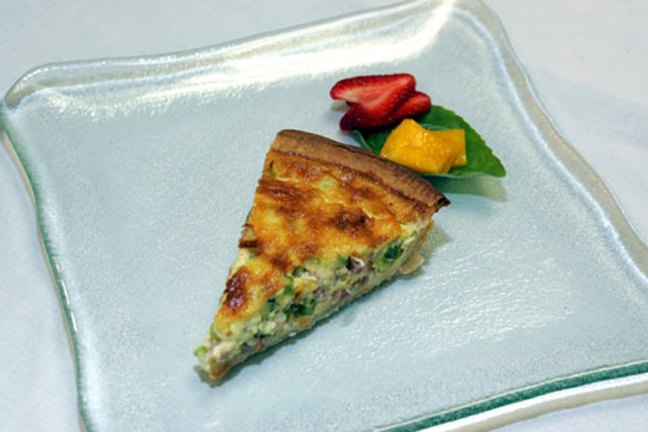 Place quiche slice opposite the fruit. Score and fan strawberry per serving and place at top of plate, above but between quiche and apple/oranges.